It is energizing and humbling to lead a team of so many passionate individuals looking to make a difference. I know that together we can create more connections for the 48 million Americans in need of hearing healthcare. EarQ announced that Andrew Hebert has been named as the company’s new president. The position was previously held by Ed Keller, founder of EarQ, who will now be transitioning to CEO. Nearing its 20 year anniversary, EarQ has stayed true to its commitment to the independent practice, and is always seeking better ways to keep patients connected with hearing healthcare professionals. In the past two years, EarQ has seen double digit growth and welcomed many new professionals to the team. Hebert’s transition to president is another significant marker of the company’s progress. Hebert first joined the EarQ team in 2007 as a Business Advisor. He demonstrated a passion for helping independent practices succeed, and quickly advanced to become the company's Sales Director and, shortly thereafter, its Managing Director. 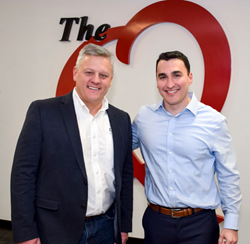 After further establishing his commitment to the company and the industry as a whole, Hebert was named EarQ’s Senior Vice President, a position he has held since December 2015. He is currently enrolled in the Executive MBA Program at Cornell and Queen’s University. EarQ has placed much importance on developing strong leaders as the company continues to grow. In fact, EarQ has promoted 15 employees within the company in the past year. These individuals have been essential in growing the company and are dedicated to bringing EarQ’s future goals to life. For more information on EarQ and how it is helping independent practices thrive in their communities, please contact 866-432-7500.